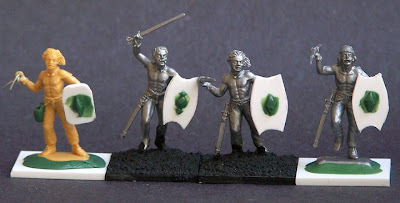 I've been putting off buying the figs for my 1/72 Celt army. It seems like almost every manufacturer has one or two boxes of 'em...but none of them are close enough in appearance to mix-n-match (for my tastes). That looks like really handy stuff that plastic card, I saw some the other day and thought about buying some, I think I will next time I come across it. Dave, Yes the difference in 1/72 figure height is annoying. My army includes Zvezda/Italeri celts and Hat's Gallic Warband and Command sets. The proportions of these newer sets mix better than older Hat sets. Secundus, I really like this material! I also use it for my bases. I don't know if this brand is available in the UK, but it's great stuff. It comes in different thicknesses, textures, etc. I added a link to the company website in the post.